I'm a coffee drinker... no thanks to Starbucks! Actually, Starbucks wasn't even around (at least not in my area) when I developed a taste for coffee, so I guess I can't blame them for my love of it. It all started on my Honeymoon of all places. Hubby and were young and not refined in our tastes, but found that they served coffee with dessert at all of the dinners on the cruise. We found ourselves trying it and loving it. I remember the coffee on the cruise bringing out the richness in the elegant desserts, and the coffee itself was a wonderful brew. Since that wonderful week, I have had a love of coffee. Starbucks didn't create the love, but has definately changed the way I look at it. I now enjoy coffee most every morning, and because I don't eat decadant desserts for breakfast, I crave a sweet creamer in mine most times. I can still drink black, but long for the richness that the creamers bring out, Hubby would just say I'm spoiled or finicky... I say give me a great dessert and then I'd rather the coffee be black! I like the prepackaged liquid creamers in the grocery store... Peppermint Mocha and Cinnamon Creme are probably my favorites and I stock up on them this time of year when they are on sale and there are lots of coupons for them. They do freeze quite well! If you haven't tried those two flavors, do.... I never thought I'd like cinnamon in my coffee and found out by mistake you could say that I like it. A friend asked if I wanted creamer in my coffee and of course I said sure... then when it was so wonderful I had to ask her what kind it was I was shocked! I do on occasion, yikes do I have to say it?, run out of creamer! I've spoiled myself enough by always having creamers available that I've found a way to make my coffee taster creamer-fied, if there ever was such a word. Here's how... I pour my normal cup of coffee and add lowfat milk to desired creaminess. Pull out the sugar-free flavored syrup that I use for my occasional at home soda-fountain style drinks & here goes, now I'll admit I purchased myself an espresso machine with money I got a few Christmases ago and I use syrups mainly for lattes and iced coffees. By the way... a little goes a long way, so the syrups seem to last forever! These syrups can be found in the coffee sections of most grocery stores and are great when you need a little extra flavor in your beverages. I have found that the best place to get them in my area is TJ Max. They often have a big 25 oz bottle of DaVinci Gourmet for $5.99, when the much smaller bottle was $4.79 in my local grocery. TJ Max carries other brands as well, but find DaVinci to be a better quality syrup. One of the other brands I tried I had to use twice the syrup to taste the flavor and then it was too sweet. and your sodas and you've got the best deal for your buck. it's a special treat like when you go to the soda fountain. 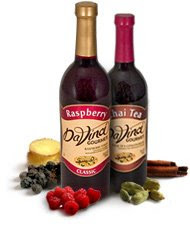 The DaVinci website also has lots of free recipes on other ways to use their syrups. Things like Gourmet Whipped Cream, Caramel Mocha Mousse & Almond Joy Italian Soda sound good to me. We have identical tastes in coffee and creamers. I've been meaning to try the sugar-free syrups, but I would never have checked TJMaxx (great tip). When I'm on the go (or traveling), I have found that a mix of Splenda and dry milk is a decent (not perfect) substitute for my whole routine at home. Thanks for the tip! I love WFMWednesday, don't you? Oh my dear sister.....can I come over? I am loving your great tips. Thanks so much....and I heart TJ Maxx too. My eyes are a bit misty from all this sweet talk!